Everyone has a white chili recipe. This is the one to make! Okay, maybe we should call this a no-precook chili! It's one of my favorite, go to recipes when I need to bring something awesome to a gathering. White Chicken Chili! Now, I first tasted this at an open house where the person who brought it also placed copies of the printed recipe next to her bowl. I initially thought, "how presumptuous!". Then I tasted it. "I get so tired of people asking me to email them the recipe, that I just bring it with me," she explained. I can understand why! Everyone took a copy home with them. 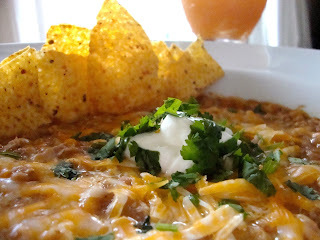 It is a different spin on traditional chili with a spicy cheesy sauce that is almost addictive. Again, this couldn't be easier to make, so no excuses. You may notice that it is the second chili recipe this week that features salsa as an ingredient. That is not accidental. It is an tasteful element that eliminates a lot of prep work. Also, you might want to make extra copies of this recipe if you decide to take it to a Super Bowl Party! That way, you won't have to send a bunch of emails. Enjoy!! Place all ingredients except the corn chips in a crockpot. Cook on high until the cheese is melted. Chili may also be cooked on the stovetop over medium-high heat until cheese is melted. When the chili is ready, add the crushed corn chips, if using, and simmer for 10 minutes to thicken. Garnish with more chips, cheese and/or sour cream and serve. Now, for this recipe, I buy boneless skinless breast, put them in a shallow pan, cover them with water and add spices like, garlic powder, pepper, red pepper flakes, whatever you like, then cook them about 15-20 mins. Then I cool them down and shred them with a fork. I have never used the rotisserie chicken so I don’t know how that is. I also use a bigger jar of salsa because we really like the flavor. The block of pepper jack cheese, grated and added at the end of the recipe is what puts this chili over the top! Great make ahead dish so you can enjoy the game too!